Faith Baxendale has always been a dutiful daughter who wishes to please her father. She doesn’t have an adventurous bone in her body, unlike her younger sister, Hope, gallivanting around Italy with their aunt, nor is she rebellious like her older sister, Honor. And so unlike Charity, who loses herself in creative pursuits. Even Mercy, at fifteen, shows more backbone! Now Faith’s first Season has ended with no clear choice of a husband, and her father’s patience is wearing thin. He urges her to marry the man of his choice. It doesn’t help when the neighbor’s son, Lord Vaughn Winborne, has returned home for the hunt ball. 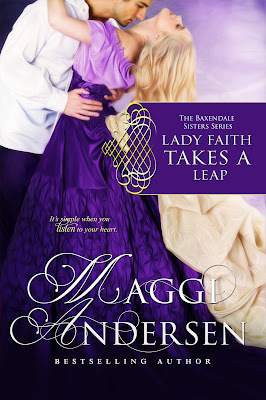 The black sheep of the family, Vaughn has fascinated Faith since she was in the schoolroom. Vaughn returns to Brandreth Park, determined to get his life on track. His elder brother, Chaloner, Marquess of Brandreth, still looks upon him as a reckless youth. But Vaughn is now twenty-six and determined to prove Chaloner wrong. A chance comes in the form of a dire scandal not of his making, and Vaughn must learn to trust Faith who, when it’s all said and done, has always known her own mind. “Mm.” Charity stood her easel on a flat piece of ground near the riverbank. “I’ll work here. The light is perfect.” She picked up her brush and palette. Taller than her sisters, Charity bent over her canvas and flicked back a fair lock, closer in color to their mother’s, a shade darker than Faith’s. “Are you looking forward to their ball?” Charity’s voice held little disappointment at still being too young to attend. “I wouldn’t let that anywhere near my face, and neither should you,” Faith said. “She is, but I prefer Attar of Roses,” Faith said. “Mm?” Charity murmured, now sunk in contemplation of her canvas. Faith turned a page of the Minerva Press novel her elder sister, Honor, had smuggled into the house for her to read. Father had banned them, saying they filled a woman’s head with ridiculous notions. The story proved to be enjoyable, but Faith felt guilty every time she opened the book. “I think I’ll paint that big oak tree over the river. I like the way the sun dapples the leaves.” Charity dabbed at her palette with a paintbrush, mixing paint. The river bordered Brandreth Park, now linked with Highland Manor through Honor’s marriage to Edward. The eldest, Lord Chaloner, was Marquess of Brandreth, their father having died some years ago. Faith closed the book, her attention caught by a fragile yellow butterfly alighting on the tree trunk beside her. Her recent conversation with her father made her too unsettled to read. It was true; her Season had been a success of sorts. A whirlwind of soirees, balls, card parties, musical evenings, and routes. But choosing a husband was like wandering in a hedge maze. One way might look promising, but then it led to a dead-end. She sorely missed Honor’s wise counsel. As Honor and Edward had a farm in Surrey, the family didn’t see much of them. But they were coming tomorrow for the Brandreths’ hunt ball. Honor was so practical she was sure to help Faith order her scrambled thoughts. Faith glanced at Charity, painting furiously, lost in her art. At sixteen, Charity was too young to discuss the important matters one faced in the grown-up world. A gentle breeze carried the smell of pine and swayed the willow fronds dipping gracefully into the water. Another barrage of shots sent a flurry of birds into the sky. On the far bank, a dog barked. Faith sat up as a hound exploded from the bushes on the opposite bank, followed closely by a tall, dark-haired man. He stopped and raised his hand to shade his eyes. Charity left her easel and walked to the river’s edge. “Good afternoon,” she called back. Faith clambered to her feet, her heart racing, as he removed his hat and bowed, revealing hair midnight black and silky straight. Lord Vaughn, a younger and more dazzling version of her brother-in-law, Edward. She hadn’t seen him since, at sixteen, she’d watched him in the Brandreth wood bagging birds for the hunt ball dinner. That had been two years ago, and she was too young to attend. She had climbed a tree for a better view until Honor had come and dragged her home. Her father had made no secret of his disapproval of Vaughn, who he saw as the most troublesome of the Brandreth men. He’d expressed relief when he’d gone to live with his sister, Sibella, and her husband in York to manage the Marquess of Strathairn’s horse stud. But here Vaughn was, standing legs slightly apart, shotgun over his shoulder, chatting to Charity across the water, and Faith, normally never lost for a word, mute as a Royal swan. “You must remember my sister Faith?” Charity was asking him. “My lord.” Faith stepped forward and dropped into a mindless curtsey. Vaughn looked different somehow, broader in the shoulders. He had been absent from all of the social events spent in the Brandreths’ company since Honor and Edward had married. Thoughts flew through her mind. Was he engaged? She hadn’t heard of it, and anyway, what did it matter? Charity stepped closer and gave her a nudge with her arm. “Say something,” she hissed. He frowned. “I’m not sure of my plans.” He shook his head. “Difficult to carry on a conversation while shouting.” He turned away. Faith firmed her lips, annoyed with herself; she’d lost an opportunity to make a good impression. But Vaughn wasn’t done with them; he’d put down his gun and walked farther down the bank. Then he backed up and took a flying leap over a narrow part of the river, alighting on a rock mid-stream. He regained his balance and jumped again, landing a few yards downstream from them. Vaughn dusted his leather breeches and strolled over to them. He swept off his hat and bowed. Up close, he was even more devastating. There was a new maturity in his face, Faith decided with a swallow. Alpha because he is going to be the top dog and He can do what he wants to and nobody can tell him wht to do.